The Start 2 S2-1361 Portfolio is a premium laminated vinyl cover case made to carry 24x36" film or digital images or artwork. The portfolio case is 1" wide. It has an interior full sized pocket and elastic straps. Heavy duty handles make it easy to carry. 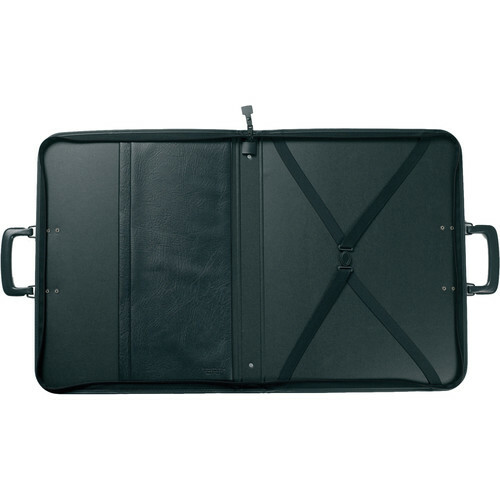 Premium laminated vinyl cover hard case made to carry images. Interior elastic holding strap made to hold the images in place. Box Dimensions (LxWxH) 38.0 x 27.0 x 2.0"
2 24x36x1" Portfolio (Black) is rated 5.0 out of 5 by 1. Rated 5 out of 5 by Anonymous from Feedback Prat Start 2 24x36x1 Portfolio The Prat Portfolio arrived in packaging damaged by the delivery folks but was well protected for shipping. This portfolio is well made, durable and professional looking. I researched a large number of options and pricing and found that B&H Photo carried the better brands and offered the most competitive pricing for what I was looking for.